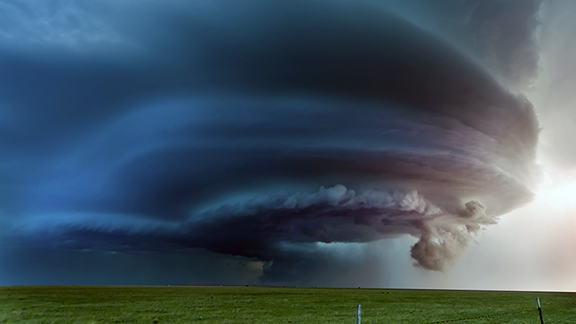 A supercell is a cyclonic cloud arrangement that gets a boost from vertical wind shear. Organized cloud systems such as these portend powerful storms as their convective fury gathers strength. Scientists are working to understand how these cloud systems are influenced and shaped by climatic forces. Enlarge Image. 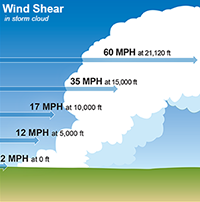 Vertical wind shear is the difference between the winds near the surface and the winds aloft in higher altitudes, either in direction or speed. Enlarge to view full image. Results: When Pacific Northwest National Laboratory scientists looked for the culprit organizing storm clouds into strong weather systems, they pinned it on a fickle force. Turns out that wind shear at different vertical levels of the troposphere, well known for batting planes off their course, has strong and erratic effects on cloud properties and their organization. 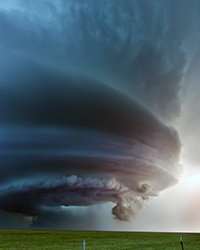 A study published in the Journal of Geophysical Research: Atmospheres shows that increased wind shear in the lower troposphere, the bottom-most level of forming weather systems, leads to more organized storm systems. 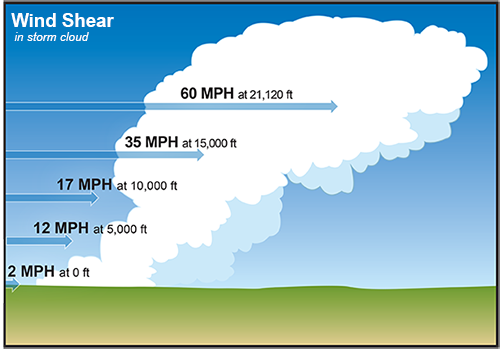 In the middle troposphere wind shear tends to produce large vorticity—think cyclone—forming a mesocyclone circulation, or supercell-like system. Strong wind shear at the uppermost troposphere does not change cloud organization much, but instead weakens the intensity of storm clouds. Why It Matters: Small individual storm systems can gather together to form mesoscale convective systems, or MCSs, covering an area of about 620 miles across or more. These "organized" storm systems occur frequently across the globe and are a large influence on the water cycle and heat budget of the Earth. Scientific understanding of MCSs is still limited, especially when it comes to how and why they begin and organize. Understanding these processes is especially important so that scientists can create more accurate formulas to predict strong storm cloud (convective, moving heat energy and moisture) systems in regional and global climate models. Methods: The PNNL researchers conducted model simulations under strong lower-level, middle-level, and upper-level wind shear environments using the Weather Research and Forecasting model, with a detailed bin cloud microphysical scheme at the cloud-resolving scale. They performed novel analyses of the time evolution and spatial distribution of dynamic and thermodynamic fields and their related diagnostics. They also performed sensitivity tests to isolate the factors contributing to the convective organization. What's Next? The researchers are working on finding the aerosol impacts on convective systems under the different vertical wind shear conditions. Sponsor: This study was supported by the Department of Energy Office of Science Atmospheric System Research (ASR) Program. In One Sentence: A PNNL study published in the Journal of Geophysical Research: Atmospheres shows that increased wind shear in the lower troposphere, the bottom-most level of forming weather systems, leads to more organized storm systems.